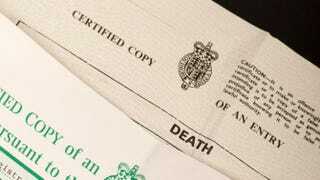 How Do I Find a Missing Death Certificate? I have a question about my grandmother Ola Mae Waters, who was born in September 1937 and passed in May 1977 in a Georgia nursing home or hospital. Her children went into foster care before her sister received custody of them. My mom and her siblings attended her funeral. However, the state has no death certificate. There are a number of avenues you can take to narrow down the details of her death so that you can find a death certificate, despite the difficulties you have encountered so far. The fact that you found the denied Social Security application was extremely helpful, so we’ll start there. According to the application, Ola Mae Waters, born Sept. 24, 1936, in “Selmer, Daniel County, Alabama,” lived in Broxton, Ga. (which is in Coffee County). Her parents were Freddie Lee Waters and Annie Mae Stevens. We found that there is not a Daniel County in the state of Alabama; nor is there a place called Selmer. It is possible the application was intended to read “Selma, Dallas, Alabama.” In order to confirm this, we searched the 1940 census for a record that would provide clarification; however, we were not able to locate a census record for Ola Mae Waters or her parents in Dallas County, Ala., or Coffee County, Ga. Via Ancestry.com (subscription required to view), we did find a record in the Social Security Death Index, 1935-2014, for an Ola Waters under the same Social Security number as the one listed on the denied application you provided us. It says she died in May 1977, as you have reported. It also says that her Social Security number was issued in Georgia in 1956. We noted that this record omits her middle name, and that her date of birth is given as Sept. 16, 1937, and not Sept. 24, 1936, as it is listed on the denied application. To see the original record for more details, you can contact the Social Security Administration and order a copy of Ola Waters’ Social Security file. Knowing that Ola Mae filed for Social Security while living in Broxton, Coffee County, Ga., you could also contact the Broxton Town Hall and determine if it keeps records on file that can be accessed. Many times, town halls keep records of the deaths of citizens and copies can frequently be ordered for a small fee. It could also be useful to examine the probate records of Coffee County, Ga. Probate records cover a wide range of functions, including last wills and testaments, letters of guardianship and administration of estates. You told us that the children of Ola Mae were taken into foster care before her sister could acquire custody, so there may be legal documents that provide information about Ola Mae’s death. While searching the collection “Petitions for Letters of Guardianship, 1904-1981” on FamilySearch, we found that a Barbara Jo Roland filed letters to be the guardian of a Fannie Mae Waters initially on March 30, 1977. Given that this guardianship is so close to the known death of Ola Mae Waters, if Fannie Mae Waters is a known relative, it would be worth exploring the connection of this Barbara Jo Roland to Ola Mae. Other collections of probate records in Coffee County may provide some additional information about the death of Ola Mae Waters, some which can be located through the Georgia Indexed Historical Records database available via FamilySearch. Another avenue to explore is to contact the Coffee County Division of Family and Children Services, the agency that handles foster care cases in Coffee County, Ga. The children of Ola Mae Waters would not have been put into foster care unless the DFCS had proof that Ola Mae was deceased, and this proof may have come in the form of her death certificate. Contacting the agency could lead to files that may contain information you are seeking. The Coffee County DFCS provides a “Birth Family Search” service, which indicates that it likely maintains records for cases of foster care and adoption for extended periods. At this point, you still may be trying to track down Ola Mae Waters’ exact date of death. Obituaries can be extremely helpful because they will sometimes provide burial information or give the name of the church where the funeral will be held. There are multiple databases that provide access to obituaries, including Genealogy Bank, Newspapers.com and Newspaper Archive (all by subscription only), as well as Google Newspaper Archives. If you can’t find an obituary in any of these databases, we would suggest that you contact the public library in the town where Ola Mae Waters died. We also suggest that you contact the nursing home or hospital to see what its records hold. When searching for an obituary, remember always to narrow your search for better results while not being too specific. In this case, we know that Ola Mae Waters was born in Alabama and her funeral was held in Georgia. It is possible that an obituary was posted in her town of birth as well as her town of residence at the time of her death, so you should search in Alabama and Georgia, as well as any other states where she was known to have resided. It is also important to use variations of her name in your search; it could be beneficial to search for “Ola Waters” and “Mae Waters” as well. Other helpful resources include Death Indexes and the database All Georgia Deaths, 1919-98 on Ancestry.com. If you’re able to locate an obituary and it mentions a church where the funeral was to be held, you can contact that church to determine if it has records of the funeral. Many churches maintain records of the ceremonies they perform, which may include the date, the age of the deceased, any family members and the individual performing the service. While they would be unlikely to have a copy of the death certificate, they may be able to provide burial information as well as an exact date of death. If you cannot locate an obituary or it does not provide funeral information, you can then search for churches in the town where Ola Mae lived, died or where you believe the funeral may have been held. If you know which religion she practiced, this can also help to narrow your options. For example, if she was a Baptist, check for Baptist churches in the town where she lived. Once you have narrowed down possible options, contact those churches and determine if any have a record for a funeral of an Ola Mae Waters that was held in May 1977. Other helpful sources are city and town directories. Directories contain lists of citizens in a particular city or town and often include an occupation and address. If Ola Mae Waters can be located in a directory around the year of her death, perhaps her place of death could be located. City directories can be searched through Ancestry.com. Attempting to locate a missing record can be a difficult process, but searching all possible locations that would have required a death record is likely to be the most effective method of uncovering the information you are seeking. This answer was provided in consultation with Zachary Garceau, a researcher from the New England Historic Genealogical Society. Founded in 1845, NEHGS is the country’s leading nonprofit resource for family history research. Its website, AmericanAncestors.org, contains more than 300 million searchable records for research in New England, New York and beyond. With the leading experts in the field, NEHGS staff can provide assistance and guidance for questions in most research areas. They can also be hired to conduct research on your family. Learn more today about researching African-American roots.